Pistachio nuts and toasted sesame seeds in 45% cocoa milk chocolate. 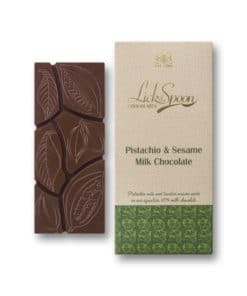 This bar started life as an egg when we married our creamy milk chocolate with pistachios and toasted sesame for Easter and it was so good, we simply had to bring it to you in bar form! 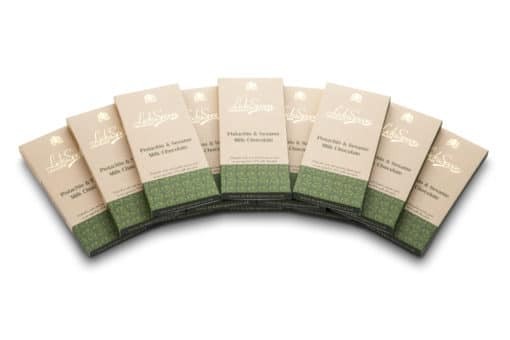 100% Biodegradeable and home compostable – plastic free packaging. 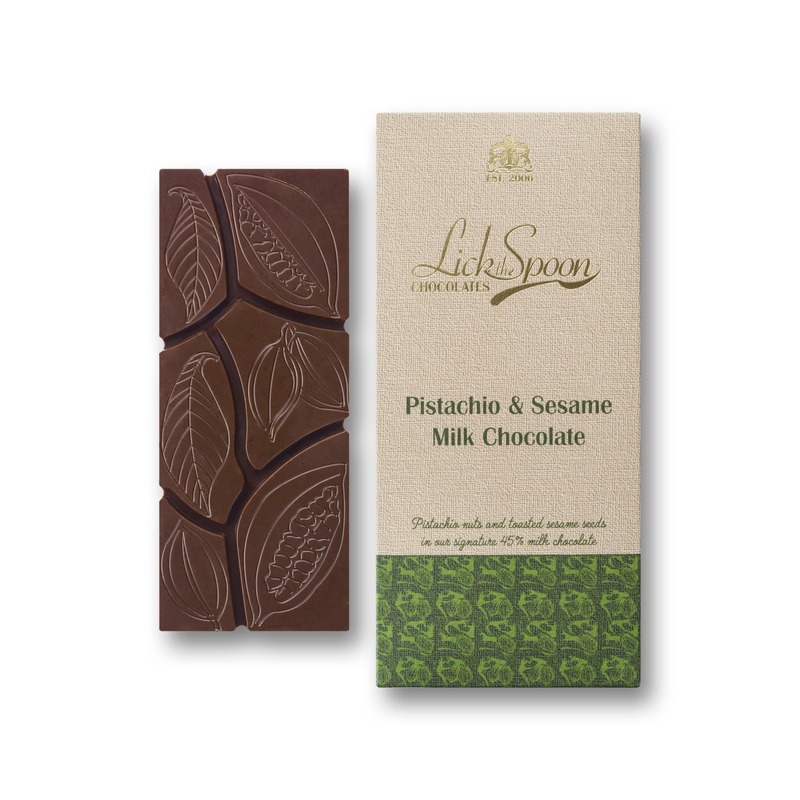 For this bar we use our 45% cocoa house milk chocolate made from fine beans grown in the Mekong Delta of Vietnam. 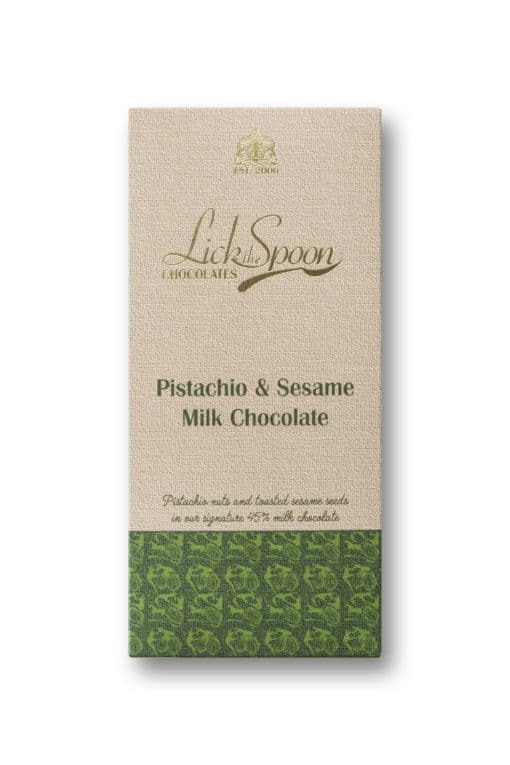 *Our Vietnamese Milk chocolate is not made with SOYA lecithin. However the packaging has yet to catch up – so SOYA lecithin is listed on the packaging. Made in a kitchen that handles Wheat, Peanuts and Soya. The box is made in the UK from card. Please recycle it in cardboard recycling. How lucky am I? I was fortunate enough to be given one of these lovely bars by LTS ! A loyalty bonus perhaps. What matters is not its price though. Simply, I sincerely recommend that you just get one and try it for yourself. Perhaps, like me, you have a partner who’s taste differs from yours. I love plain: she prefers milk. Whatever, this bar will please almost everyone. The flavours are fabulous and the eating experience wonderful. I rather like the bar’s pattern too. There are large portions and smaller ones. Great for sharing. Have fun!